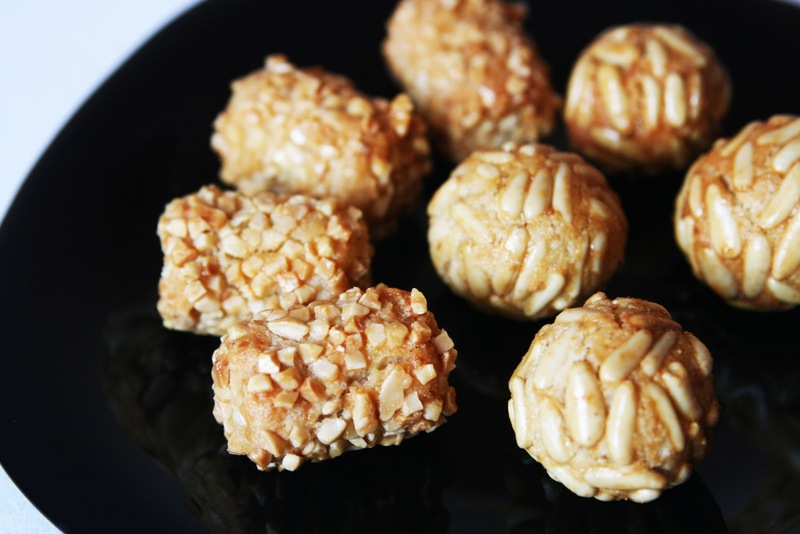 Right one week before we celebrate in Catalonia the festivity of 'La Castanyada', I'm sharing with you a recipe to make the traditional sweet 'panellets'. For those of you who live outside Spain the word 'panellet' must sound a tad bit weird and you'd ask "what are panellets?". 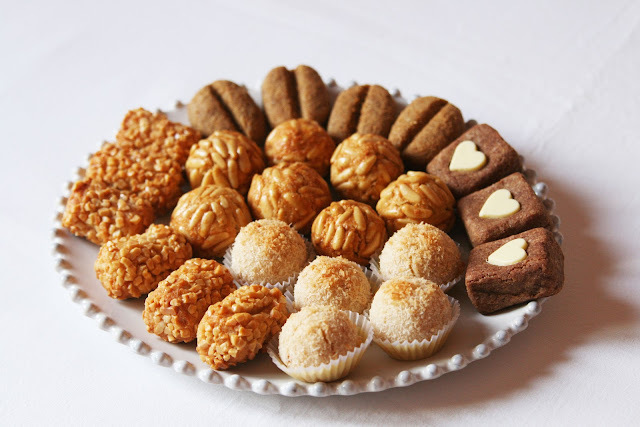 Well, don't freak out, panellets literally mean 'little breads' in Catalan and they are like cookies made out of marzipan that we eat on All Saints Day. To me 'La Castanyada' is a celebration of autumn, a way to sweeten up and enjoy Halloween and a good excuse to indulge on sweets and have a fun time in the kitchen making these little marzipan treats. But I found a website where you can find a more accurate and complete description of what this festivity is all about. On this day we also eat roast chestnuts and roast sweet potatoes (these are one of my addictions!). 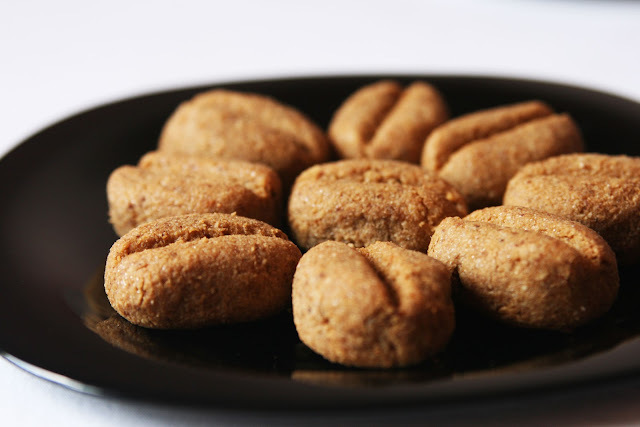 These marzipan cookies are really easy to make, we just have to be careful with the cooking time because they have to be squishy on the inside. * Potatoes: If you live outside Spain I recommend the 'Sebago' variety of potato. (Per als que viviu a Catalunya, os recomano els Trumfos del Pirineu, són perfectes). Place potatoes in a saucepan with enough water to cover and a pinch of salt. Bring to a boil and cook until tender. Peel off the potatoes skin and stab them with a fork until you get dry mashed potatoes. Once they are cool, add sugar, ground almond and lemon zest, mix and smash well all ingredients to get a good, thick paste. Set aside while we prepare the rest of ingredients. Spoon out dough, roll dough into small balls in your palms. 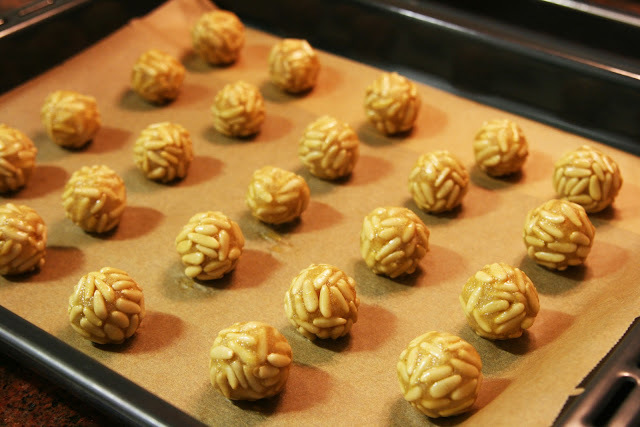 Brush each with a bit of egg white; then roll the balls in pine nuts. Place on greased cookie sheet and brush them with whisked egg. Note: I don't like to grease the baking sheet, I prefer to use a parchment paper to protect the sheet. Same process as the pine nuts cookies. Most probably you'll need to add an extra amount of chips of almond chips and pine nuts manually, one by one, to make the cookies look better. That's because some pine nuts or almonds will tend to fall off but using your hands and having a little bit of patience will be enough to have beautifully decorated and eye-catching cookies. If you want to flavor the cookies separate a portion of the dough and with your hands, work in a bit of instant coffee powder (a teaspoon will suffice). 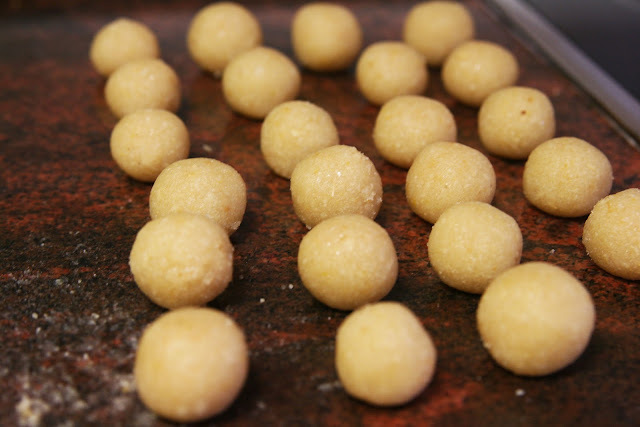 Make individual balls and place on cookie sheet. Same as the coffee ones. Add desired amount of cocoa powder (1 or 2 teaspoons). 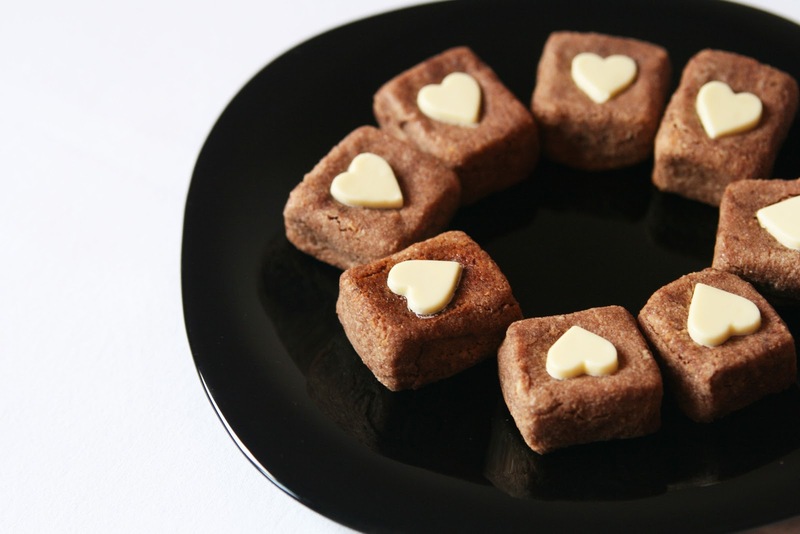 We can also pour in some melted chocolate over the marzipan cookies after baking them. 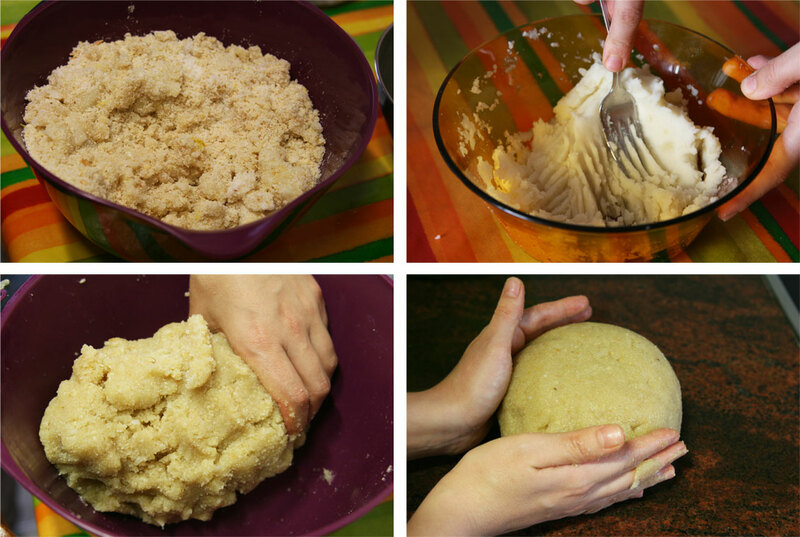 Add desired amount of grated coconut to the basic dough. 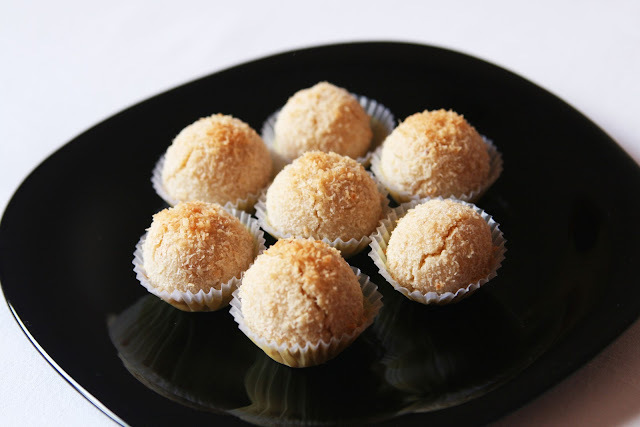 Roll into balls and roll the balls in grated coconut. 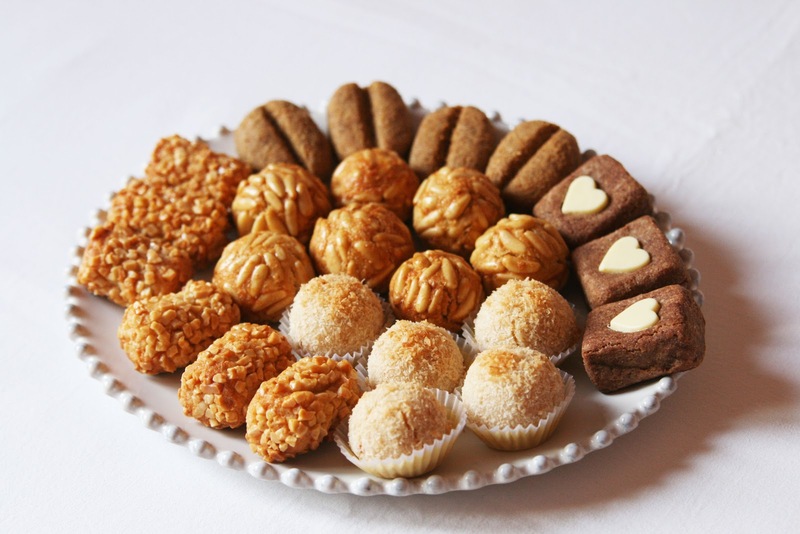 Place them on the cookie sheet with the rest of the 'panellets' cookies. Note: the size of the dough balls should be approximately of 1.35 inches (around 3.5cm). Bake for 15-20 minutes in the preheated oven to 356 F (180ºC), until the tops are lightly brown. Gently remove from the baking sheets and cool on a plate. Remember they have to be squishy on the inside. te han quedado genial gemma! Muchas gracias Marta! En realidad estos son los panellets que hice el año pasado, pero quería publicar la receta antes de la Castanyada por si alguien se atreve a probar mi receta y quiere hacerlos, así que he utilizado estas fotos. La semana que viene subiré alguna foto de los que voy a hacer.